Conflict in Syria has displaced millions of citizens from their homes since protests against the al-Assad government began more than five years ago. An estimated 12.5 million Syrians are now displaced, amounting to about six-in-ten of the country’s 2011 midyear population – and up from less than 1 million in 2011, according to a Pew Research Center analysis of global refugee data. The displacement of Syrians is unprecedented in recent history for a single country, our analysis of United Nations High Commissioner for Refugees (UNHCR) data found. For example, conflicts in Afghanistan during the Soviet incursion in the 1980s resulted in about half of the country’s population being displaced within or outside its borders. Less than a fifth of Iraq’s population was displaced when violence rose in 2007 and 2008. And more than 2.5 million Rwandans, or less than half of its population, were displaced during the 1994 genocide. Previous estimates since 2014 have found that about half of Syria’s pre-conflict population had been displaced. That share has risen to about 60% as more than a million additional Syrians crossed international borders into neighboring countries like Turkey or left for more distant destinations in Europe. Early in the conflict, displaced Syrians largely moved within Syria. In 2011, an estimated 600,000 Syrians, about 3% of the population at the time, were displaced within the country. By the end of 2012, after the civil war began in earnest, that number had grown to 3 million. By the end of 2012, large numbers of displaced Syrians were living outside the country, including half a million in neighboring countries such as Turkey, Lebanon, Jordan, Iraq and Egypt. By the conclusion of 2013, the number of Syrians living in these countries and North Africa had grown more than fourfold to 2.3 million. In addition, the number of asylum seekers from Syria living in Europe had more than doubled to 79,000. The number of displaced Syrians continued to grow in 2014 and 2015. By then a major migration shift had begun, with the number of displaced Syrians living outside the country growing more rapidly than the number displaced within the country’s borders. Indeed, between 2013 and mid-2016, the share of all displaced Syrians living outside their homeland has roughly doubled, from 27% to 47%. However, displaced Syrians within Syria are still the majority. Western media have highlighted Syrian migration to Europe. Since the beginning of the Syrian conflict, the total number of Syrians applying for asylum in European Union countries, Norway and Switzerland has grown to more than 700,000 – nearly 10 times as many as in 2013. Including the 300,000 Syrians estimated by UNHCR to have applied for asylum in Serbia, the number seeking asylum in Europe totaled more than 1 million by the middle of 2016. However, the number of Syrians displaced within the country and in neighboring nations is far larger than the number in Europe. 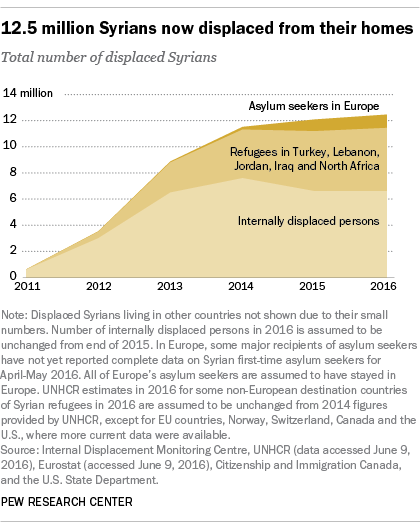 As of mid-2016, about 4.8 million Syrian refugees live in neighboring countries, with nearly four-in-ten of the nation’s refugees residing in Turkey, Lebanon, Jordan, Egypt or Iraq. By comparison, about half of Syrian refugees have relocated within the country and less than one-in-ten now live in Europe. At the same time, the United States government has pledged to resettle 10,000 Syrian refugees by the end of fiscal 2016. Since the beginning of 2016, just 2,131 Syrian refugees have been resettled in the U.S., with more arriving since the beginning of May 2016 than in the previous year combined. The estimates of total Syrian displacement are based on the most recent data from UNHCR’s Syria operation, UNHCR’s global data, the Internal Displacement Monitoring Centre, Citizenship and Immigration Canada, the U.S. State Department and Eurostat, Europe’s statistical agency. It is possible that estimates of the number of displaced Syrians are high if, for example, refugees are counted twice when moving from one country to another. Estimates could also be low since the number of internally displaced persons is not known for some regions of Syria, and some refugees in neighboring countries may have not registered with the UNHCR.